Beat eggs in medium bowl. Add milk, sugar, oil and bananas and mix well. Add flours and baking powder. Mix gently. 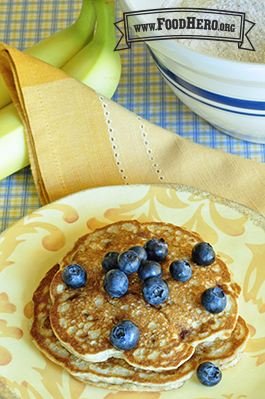 6 Comments for "Banana Pancakes"
I have found that this recipe doesn't need so much baking powder, at 2 teaspoons you can taste it in the finished product, 1 1/2 teaspoons allows for enough levening and no taste. My kids love this recipe, even the picky eaters. These are so easy to make for my 3yo with just one bowl and i love how they cook so fast and fluffy! I did use Buttermilk instead of regular milk and cinnamon and vanilla extract. These pancakes are delicious! Yogurt on top is a perfect addition. They also freeze perfectly and are ready to be popped in a toaster for a very quick and healthy breakfast! Surprised many middle school and high school students with how yummy this recipe is. Taught them how to prepare it in after-school program. Ate them hot from the grill no toppings needed. Loved it! My kids like to make these with me.